» Is Honey Good for Weight loss? Honey heals your body and mind. Its weight controlling aspects are now widespread globally. If you love sugary drinks and you’re planning to lose weight then adopting honey can be a good alternative. There are many reasons for your new healthy choice because it has lesser calories and better health-promoting profile than sugar. Scientific evidence also proves the claim and find honey a healthy alternative to sugar with its many medicinal properties like antimicrobial activities, wounds healing capacity as well as antibacterial property. But the use of honey always comes with an advice and that is, use it in moderation. 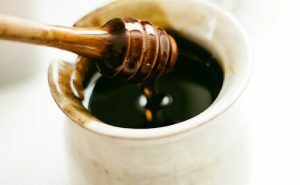 Honey Nutrition: What Makes Honey the Best Remedy? Honey has mainly sugar and water its two main constituents. Honey gets its health-promoting properties from vitamins ( ascorbic acid, riboflavin, niacin, pantothenic acid), minerals (copper, iron, zinc, calcium, potassium), proteins, polyphenols, enzymes, antioxidants, amino acids it has. If you dig deeper you may find out that honey has nearly 200 different biologically active compounds that provide multiple benefits to your body. Honey contains nearly 2.4 grams of sugar for every 3 grams of serving. And 1 grams of sugar contains 3.9 calories. Taking honey as a sugar alternative helps you consume lesser calories. This helps to balance calories taken and calories expended. And when it is balanced your body does not accumulate fat as a result of excess calorie intake. Another good thing of honey is its fructose content. Honey contains more fructose than any other form of saccharides. Many studies also correlate the fact and find honey a better weight reducing alternative than sugar. However, still more work has to be done in this field to conclude and confirm scientifically the beneficial effect of honey for fat loss. Obesity is a serious condition for an individual as well as for the nation. It should be addressed and controlled before it leads to other serious health conditions like stroke, diabetes mellitus, and cardiovascular diseases. Often the cause of obesity is energy imbalance i.e taking more calories and expending lesser. But, it could be easily controlled if you follow some basic things like doing regular exercise, eating a healthy diet, controlling calorie intake and changing your lifestyle. Honey is an ancient home remedy and finds a good place in treating varieties of medical conditions including weight reduction. The reason is the rich nutrient content of honey and lesser calories content than sugar. But, you must always remember that it has added sugar and sugar may kill your weight loss efforts. It must be used in moderation to reap the benefits not risks. What are your thoughts about using honey for weight loss? Do you believe honey is good in losing excess fat? Don't forget to share your thoughts in the comments. Previous Post This Is What Experts and Studies Say About Using Acupuncture for Lower Back Pain Next Post How does magnesium lower blood pressure levels?